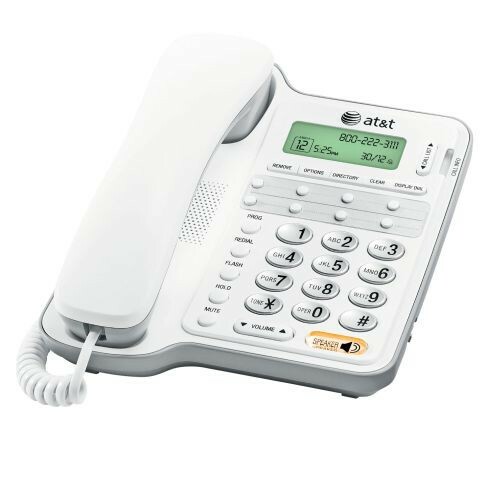 Speakerphone with Caller ID is a simple telephone for ease of use. The handset is corded, so you don't need to worry about misplacing and losing it. If you do not want to hold the handset, you can always use the Clearspeak speakerphone built into the base. This also allows more people to join in on the conversation. The phone can even store up to fourteen numbers as speed dial options. In addition, this phone does not require an AC power source. This saves you an electric outlet! This telephone has a screen to view caller ID and call waiting, too. Caller ID will keep a history of 65 names and numbers for you as well. The Caller ID and all of its features do require a subscription with your telephone service provider as well as 4 AA batteries such as the Duracell ProCell.